Dr. Javid Saifi, a graduate of Rutgers University, received his medical degree at New Jersey Medical School. He performed his internship in Internal Medicine at Brocton Veterans Affairs Medical Center. Dr. Saifi performed his residency in General Surgery at the Albany Medical Center, where he subsequently completed a Fellowship in Vascular Research. 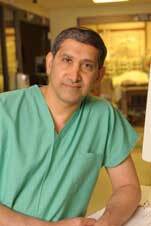 Dr. Saifi performed his residency in Cardiothoracic Surgery at the Albany Medical Center. He subsequently practiced adult Cardiac Surgery in Charleston, West Virginia before returning to Albany. He joined Albany Cardiothoracic Surgery in 1994. Dr. Saifi is Board Certified in General and Thoracic Surgery, and is a Fellow of the American College of Surgeons and the Society of Thoracic Surgeons.